Believer, skeptic or bystander, few would deny that "climate change" is a hot topic. From extreme weather patterns to the recent flooding of Lake Champlain the effects of global warming and climate change in general is hard to ignore. On January 21, ECHO will explore the impacts of climate change with the opening of the new exhibit Seasons of Change. Members of ECHO will enjoy exclusive benefits including early admission and continental breakfast between 9 and 10 a.m., 20% off shop sales throughout the day, and the ability to bring guests (equal to your current membership) free-of-charge to enjoy all that ECHO has to offer. 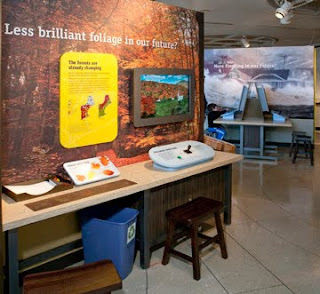 Throughout the day educators will encourage visitors to get wild about weather through demonstrations and hands-on encounters such as: The incredible journey of a raindrop, learn how to build your own weather station, discover why we have seasons, and observe a cloud formation right at ECHO! At 11 a.m. and 1 p.m., special guest Amy Seidl, UVM Professor and author of Finding Higher Ground and Early Spring, will present a program entitled When Lilacs Bloom. We've all noticed the weather changing - from earlier springs to record-setting storms - but how are these changes affecting the landscape around us? Dr. Seidl will help us see how flowering lilacs, migratory songbirds, autumn colors, and other seasonal events are signals from a warming world. If you aren’t currently a member, join ECHO today to take advantage of this very special program. As an added bonus, if you join before January 31st, ECHO will match your gift by giving an equal membership to a low-income neighbor through our You Give, We Give program.